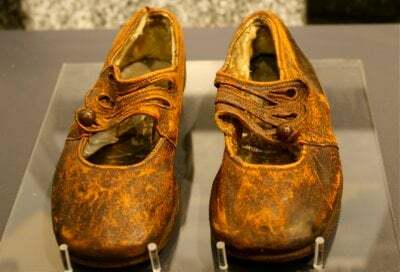 A small pair of brown shoes have provided the determining factor in deciding the true identity of Titanic's Unknown child. A small pair of brown shoes that were hidden away in a police sergeant's desk in 1912 have provided the deciding clue to the identity of Titanic’s “Unknown Child”. Scientists and Titanic students have been searching for irrefutable DNA evidence to positively identify the Titanic victim remembered as the unknown child. But, when it comes to examining samples from 90 year old graves, science is not as precise as we wish it could be. The aftermath of the Titanic disaster involved a grueling recovery operation to bring the bodies back to shore. Halifax, Canada, was chosen as a convenient location for the salvage operation as it was the closest port that had a railway connection. Some of the bodies were laid to rest at sea while 209 others, many of them unidentified passengers from third class, were brought to Halifax. 150 of the dead were buried in three cemeteries in Halifax. Over 40 of them remain unidentified. The marker at his grave has come to represent the lives of all 50 children who died in the sinking on April 15, 1912. On it is written: Erected to the memory of an unknown child whose remains were recovered after the disaster of the Titanic April 15, 1912. Ruffman worked doggedly in his quest to track down the descendants he needed to find. Dozens of people from historians and genealogists to family members joined him in his effort and he was able to make the contacts needed to gain the DNA samples to be tested. Three of the five boys were immediately identified as non-matches. But, the remaining two both came up as possible matches. They were Eino Panula and Sidney Goodwin. However, in examining the evidence beyond the DNA, it was decided the Goodwin boy was too young to have the shape and condition of the teeth that were recovered from the grave. In November of 2002, Alan Ruffman and Dr. Ryan Parr announced that the remains of the unknown child were most likely that of the boy from Finland named Eino Panula. This week emerged news that Dr. Ryan Parr believes they had made a mistake and that the young victim is actually Sidney Goodwin of England. Dr. Parr is now Vice-President of Research and Development of Genesis Genomics in Ontario. He and his colleagues have written an article for the June issue of the journal, Forensic Science International: Genetics, in which they state: “the remains of the young boy are most likely those of an English child, Sidney Leslie Goodwin”. The deciding factor was the existence of the shoes, which were donated to the Maritime Museum of the Atlantic in Halifax in 2002 and are now on public display. Clarence Northover, a Halifax Police Department Sergeant in 1912, helped guard the bodies and belongings of the Titanic victims. Excerpt from July 26, 2002 letter by Earle Northover, grandson of Clarence Northover. Ultimately, the little shoes were to provide the final clue needed to determine the identity of the boy. On examining the shoes almost one hundred years after the disaster, it was determined that the shoes were too big for a child that was only 13 months old. Sidney Goodwin, 6 months older than Eino Paluna, had to be the boy who wore the shoes. Shoe picture is from the Maritime Museum of the Atlantic.